That was a terrific win in Miami the Bulls had last week. And then there was that basketball clinic the Bulls put on Monday in a win over the Cleveland Cavaliers. Which, unfortunately, has led to a numbers of emails I’ve received in the last few days. On doing some research and finding out this wasn’t a relative of Boozer’s writing the email, I have to paraphrase Neil Funk. There’s been a lot of Derrick Rose talk these last few days in the media, stuff about how he’s running or looking improved or skipping his Skittles. Nothing, however, has changed. He’s still out most likely until at least the All-Star game, if not longer. And then when he returns, there could be all sorts of limitations on playing time. But the Bulls’ 104-96 loss to the Milwaukee Bucks Wednesday in the United Center emphasizes a few things as much as ever. The Bulls’ margin of error is so slight without Rose that they need at least three or four players having better than average games. Against the Bucks, it was pretty much Boozer with 22 points and 11 rebounds, and perhaps a bit of Luol Deng with 18 points. The box score shows 19 points and three three pointers for Nate Robinson, who had a huge first quarter in helping the Bulls take a 33-22 lead. But with Kirk Hinrich out again, this time with an elbow injury, Robinson had to play almost 43 minutes and was three of 11 after halftime. While also apparently supplying some motivation to the Bucks Brandon Jennings, who scored 20 of his game high 35 points in the third quarter when the Bucks regained — and never lost — the lead. The irony, of course, is Jennings often plays equally out of control. Which the Bulls always have taken advantage of with Rose. Jennings yearns to be considered in that class of great point guards. So when matched up with one, like Rose, he usually tries to outdo him and takes some of the most unusual shots you’ll see this side of Ron Artest. Rose plays little attention to that stuff, and it usually causes Jennings to lose control of the game. But Jennings had Robinson on him this time. So being without Hinrich was particularly devastating in this game given the great athletic abilities and skills of the Bucks’ guards. Jennings and Monta Ellis outscored the Bulls starting backcourt 49-23. And while the Bulls managed to stay close down the stretch despite shooting six for 25 in the fourth quarter, they didn’t have quite enough as the level of their playing ferocity wasn’t nearly as high as usual. I’m hardly faulting Robinson because he did have a good overall game. But he’s not a true point guard, and he’s never been a strong defender, especially given his diminutive size for an NBA player. And then to ask him to play almost 43 minutes as rookie Marcus Teague had a rough outing in his five minutes is probably too much for Robinson. Jennings simply overwhelmed him. And there wasn’t much two-man pressure off Milwaukee’s pick and roll, which the Bulls did more effectively earlier in the game. Jennings can get hot. He scored 55 points in a game in his rookie season. Usually you try to pressure him and get him frustrated, which leads to questionable shots. But the Bulls pretty much left him to Robinson after halftime and the Bulls suffered from the matchup. Yes, Boozer did have his sixth straight double/double, and the Bulls could have gone to him more as he only had six second half shots after scoring 14 points in the first half. But without Rose or Hinrich, the latter who may play Friday in New York, the Bulls aren’t exactly a shutdown team by opening the game with Robinson, Boozer and Richard Hamilton starting. Hamilton never got much going and played just over 16 minutes and shot two of 11. His backup, Marco Belinelli, got the bulk of the shooting guard time. But he was four of 14, including one of eight in the fourth quarter. Deng was steady with 18 points and five rebounds. But Thibodeau appears to be cutting Deng’s minutes as Deng played just over 34 minutes and fewer than four in the fourth quarter with just one shot. Deng has been under 40 minutes in nine of the last 11 games. So Dunleavy had seven of his 10 fourth quarter points — 16 overall — while Deng still was out. Dunleavy is a good shooter, but one of the poorer defenders. Yet, the Bulls didn’t work hard to find Deng when Dunleavy was guarding him, similarly missing Boozer as Thibodeau noted in the increasing one-on-one play down the stretch. The Bulls offense is geared toward point guard scoring and playmaking. But I know Derrick Rose, and you, Nate Robinson are no Derrick Rose. No one is asking him to be. But when the Bulls cannot get across the board contributions, it’s trouble. It hasn’t happened much of late, which is impressive. But Joakim Noah and Taj Gibson had pretty indifferent efforts. 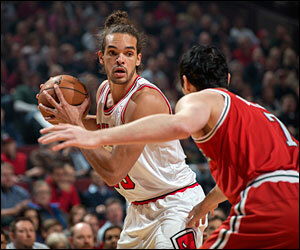 Noah did have 12 rebounds, but he shot four of 12 for eight points while Gibson also added eight points. Milwaukee is a guard oriented team with league leading shot blocker Larry Sanders, who had seven blocks and 12 rebounds as the Bulls went back to being outrebounded. The Bulls seemed to walk into several blocks instead of going hard at Sanders to get fouls or limit his defensive reaction. You generally have to be aggressive with shot blockers, which the Bulls also didn’t do. They were attempting too many soft floaters and jumpers that Sanders was swatting away like annoying mosquitoes. No, I don’t necessarily mean Nate. It’s obvious the Bulls could use some point guard help, especially if Hinrich is out for any long period of time. Though he is not expected to be. Rose certainly will help, but that’s not particularly close and certainly uncertain. Well, there’s hustle and there’s hustle, and this didn’t appear to be one of the more energetic nights for the Bulls. Though it looked like it was going to be. In addition to the trio of three pointers Robinson made in the first quarter, he was playing Jennings effectively and Jennings was scoreless in that first quarter. It seemed like it would be an easy game, and you figured the Bulls wouldn’t lay off after the Bucks the last time in Chicago overcame a 27-point deficit to beat the Bulls. Whether the Bulls players had that in mind or not, their play in the first quarter seemed a harbinger for a revenge win. Led by Robinson’s 13 points, the Bulls shot almost 60 percent and were ahead 21-7 about seven minutes into the game. But it was more due to some long threes from Robinson. The interior passing which was so good against Cleveland wasn’t there as the Bucks, with former Bulls interim head coach Jim Boylan now the interim for Scott Skiles, had the Bucks packing the interior. Boozer had a few strong moves at Ersan Illyasova for scores. But the Bulls didn’t do a very good job searching out Boozer with the Illyasova mismatch and Deng against Dunleavy. It’s on some level the price you pay for Robinson at point guard. Though it’s hardly his fault as he’s more a shooter for short stretches. The Bulls mostly maintained in the second quarter, keeping that double digit lead until a late Jennings three left Milwaukee trailing 57-50. But rookie Teague had a tough stretch with turnovers and uncertainty and Teague only played 20 seconds in the second half. Belinelli did have a pair of scores in the second quarter and strong slashing moves to the basket, and Boozer kept up his aggressive play with a hard drive drawing a foul from Sanders and a nice tip of a Noah miss. The Bulls do always play hard. But it is in the degree. That extra step was missing Wednesday. And that enabled Jennings to get going as the Bulls weren’t giving Robinson as much help on Jennings as he’d had earlier in the game. Not like it wasn’t in the plan. But sometimes the best laid schemes of mice and men go awry. The Bulls were being dominated on the boards in the third quarter as Jennings had three shots in one possession, making the third. The Bucks had a 17-8 rebounding edge in the third and three times as many assists as the Bulls in the quarter. The Bucks led 81-80 going into the fourth quarter, though they led by nine with about three minutes left in the third before Boozer and Deng led a 12-4 finish to the quarter. Everytime the Bulls got back in position to move ahead, it was the Bucks, now 18-16 compared with the Bulls at 19-14, who made the shots as they scored the first five points of the fourth quarter. 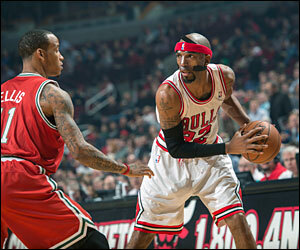 Gibson answered with a good spin move for a score and Boozer continued to hit the boards with another putback score. But the Bucks had an answer every time as they went to 2-0 since Skiles was relieved of his coaching duties and seemed much relieved. The Bucks got several wide open looks in the fourth, untypical of this Bulls group, and the eventual undoing was probably with about a minute and a half left and the Bulls trailing 100-96. Belinelli missed a three, and as the Bulls got the ball back two more times, Belinelli drove and was stuffed each time. Jennings then followed that sequence with a runner for a 102-96 lead with 24.6 seconds left and the effective end of the Bulls’ modest three game winning streak. On the next Bulls’ possession, Noah threw away the inbounds pass, which led to a clear path foul and a few last points for the Bucks and Jennings. The Bulls did have a huge 56-34 edge in interior scoring even with all those Milwaukee blocks, 15 overall. But it was the Bucks also taking advantage of the Bulls somewhat lackluster effort with a 19-6 edge in fast breaks.